There was an article earlier today in Sky Sports that West Ham had made a £20M initial offer for Newcastle captain Jamaal Lascelles, rising potentially to £25M. But today when interviewed in the Chronicle Rafa said he had not heard of any offer for his captain and took the opportunity to say that he is not for sale. Other clubs have been linked this summer with potentially making a move for the center-back with Chelsea being one of them. So it wouldn’t be a massive surprise if bids do come in for him but Lascelles is a key player and leader for us – one reason he is the captain – and a very good one too. When we have a good player at the club, Rafa will want to keep them, and he will not put up with Mike Ashley selling one of his best players. Rafa wants to have an outstanding team on the pitch and not a lot of money in the club’s bank account. Anyway – when is Ashley going to sell the club? 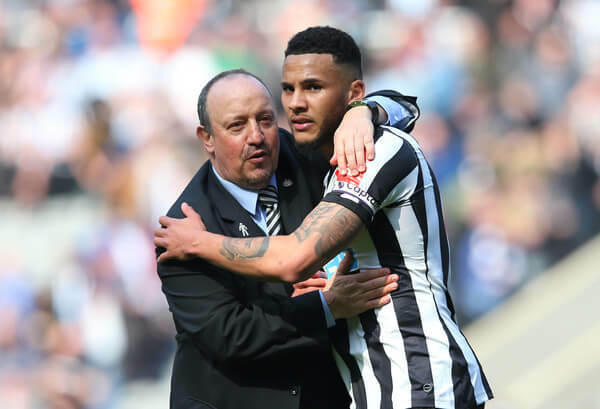 Rafa says he doesn’t really want to sell Lascelles. He doesn’t really want to but if………. That’s not a categoric ‘Not For Sale at any price is it? Eastbourne has an annual air show which features the Battle of Britain Flight. When turning in for a run over the sea, the Lanc passes directly overhead of our house at a few hundred feet. It’s awesome to see and hear….. When the Canadian Lancaster came over to the UK in 2015 for the 75th anniversary of the Battle of Britain, I saw both together at Goodwood (Chichester). Was awesome. Also saw 20+ spitfires at the same event with some flying in a large wing. The sound was just incredible. My first ever proper job was working at the factory in Manchester that made the Lancaster – sadly now closed. Want some more irrelevant blurb? “It’s coming home” has thirteen letters. Is it safe to come on now and mention how good it is to get another loan for Kenedy, gives us a bit of room for manoeuvre on buying players etc… Plus wasn’t it put forward that Chelsea in their current turmoil are battening down the hatches and as such didn’t want to sell Kenedy just yet? Interesting stat that nearly half of these players left competing in this cup ply their trade in the PL. Good one to load in the cannon for when anyone says it’s a fading league or the Primera Liga is better etc. Actually that’s not a stat. It’s a FACT! Eerie silence where I’m living! ToonRich, I think G2 is right, it’s probably Yannick Toure. Or Michy Batshuayi if I squint hard enough…. Let’s hope that France v Belgium is a vicious, physical encounter that extends into extra time with heavy injuries and plenty of bookings etc. Some injuries to significant players that would rule them out of the WC final and delay their return to the PL would also be welcome – though I’m not proud to say it !! My Grandad worked at Avro during the war building Lancasters. He couldn’t serve due to a dodgy knee. He fell from one of the high gantries messing round trying to impress my Nan and broke his back, back at work in three weeks. I wasn’t trying to impress your gran though, I promise! Bobby – I think this is the tech you need. Development as usual will be spurred on by military application but I can envisage a near future where this will be defacto and the motorised cart and wheelchair will be special order or museum exhibits! I somehow think this will not be a goalless game in normal time. Lol Bobby, you’d struggle, believe me…. Even when she was alive she was a hard woman to please. France struggling here dear oh dear they will be hoping they run out of steam. Spam mail is everywhere these days. This lot are a loose canon. West Ham are in discussions with Lazio to sign midfielder Felipe Anderson for a club record fee of around £40m. The Hammers have already signed Jack Wilshere and Ryan Fredericks on free transfers this summer, plus spent £29m on Issa Diop and Lukasz Fabianski. They are also close to completing the £17m transfer of Ukraine forward Andriy Yarmolenko from Borussia Dortmund. Who was after calf strains? Tsunki, sounds ideal mate, wonder if they need any Guinea pigs? 🙂 I’d give it a go for sure. Thing with osteoporosis is you don’t get impact fractures, it’s just the structure of the bone that splits. Fourth time now! I’m lucky compared to some apparently. Obviously any serious accident could be deadly, but as my gymnastic days are over and mountaineering is out of the question, I can’t imagine any situation where I could break a limb – excluding another RTA or similar, but we all have that issue. Rob – yes please! Who needs a bloody wheelchair when you’ve got that eh? Lmao. Technology is literally flying along now, no pun intended. Won’t be long before that esckoskeleton thing Tsunki posted is reduced in bulk and made into a viable product for people like myself. Too late for me, but nice thought that people in the future won’t have to struggle just to move around. Pity it takes military applications to boost medical projects. Has any football team ever lost to a team in a World Cup group match and then played that same team again and won in the final? That’ll test someone’s memory. I have no idea of the answer but am interested to know. Well who’d have thought it, Tsunki is a Pink Floyd fan. Can’t see this game finishing nil nil. There’s enough quality out there to result in a goal or two. Regardless who wins, gonna be a tough final for whoever gets there. BTW, I stand by what I said a few posts back, 0-0, France to win on Penalties.